How much do we spend on admin/running costs? 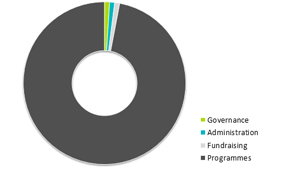 For every pound AET receives, we spend less than three pence on our administrative and running costs, which is significantly lower than other comparable charities of our size. We are able to keep our running costs so low because of our grassroots approach. We don’t have big offices overseas, or employ out-of-country staff on high wages. Our field staff are local people, paid at local rates, who often share office space with other organisations. We prefer to place local outreach officers in our communities rather than buy expensive vehicles, which require a lot of maintenance and can attract unwanted attention. Our grassroots approach is great value for money and is one of the keys to our success as an organisation. We are committed to maintaining low running costs while also increasing our visibility and outreach in the UK to support expansion of our work. Where do we get our income from? The majority of funds for our work come from large institutional donors such as the European Union, UNICEF and DFID. Our ability to meet their high standards of accountability and transparency and deliver results has led to multi-year relationships with these donors. We are also supported by a variety of trusts and foundations of different sizes. However, individual donation, fundraising efforts and corporate partners provide an equally important source of funding that allow us to stay innovative and creative in designing new projects and ensure we can be flexible within the unstable regions where we work. Download our latest Annual Account Statements to see our detailed financial information.